Every business should have their 'Business on a Bin'. Why? Because it's a cheap, easy cost effective form of advertising that’s sure to get you noticed. Why not have your favourite photo, image or child’s artwork turned into an amazing wheelie bin sticker panel? That’s right we can take your digital image and transform it into one of our fabulous full colour personalised wheelie bin sticker panels. Simply upload your image on the product page when purchasing and we will send you a PDF proof to approve. When your happy we will print and dispatch your wheelie bin sticker panel to you in double quick time. Use your bin to profile your business, promote your key services, launch of a new product or service, sales and discounts, recycling and safety regulations or even corporate giveaways and promotional gifts. 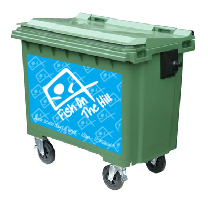 Take a look at the Wheelie Bin Sticker Panels For Business page by clicking here. We offer every school the chance to get a FREE wheelie bin sticker panel and 30 sheets of stickers. For more information click here. Choose from a wide range of Landscape inspired wheelie bin stickers and wheelie bin sticker panels and transform your boring old bin! Available in 4 popular wheelie bin sizes, our Landscape inspired​ wheelie bin stickers are contour cut to size so there is no need to get the scissors out! Easy to fit and suitable for any flat or slightly curved surface, even if it's not your bin! So bring out the view in your wheelie bin and get sticking! 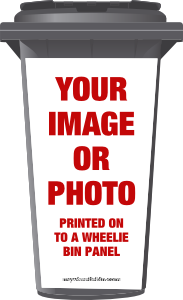 All the great wheelie bin sticker panels we manufacture here at mywheeliebin.com .. Simply upload your image on the product page when purchasing and we will send you a proof to approval. When your happy we will print and dispatch the wheelie bin sticker panel to you in double quick time. 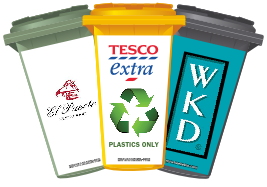 We also have a great range of wheelie bin numbers, wheelie bin stickers, recycling box numbers, recycling box stickers, food caddy numbers and food caddy stickers. All our bin numbers and bin stickers are made from hard wearing self adhesive vinyl and die cut to shape - no cutting out with scissors like some others on the market! So browse the range and try our wheelie bin sticker numbers and wheelie bin stickers or wheelie bin sticker panels, we're sure you will love them as much as we do!